He’s more interested in chasing them and playing with them rather than attacking or killing them. However, precisely because I have Dixon, I didn’t know what commercial techniques I could use to get this problem under control. Glue traps, spring traps, “zap” traps, and rodenticide all seemed extreme and inhumane. 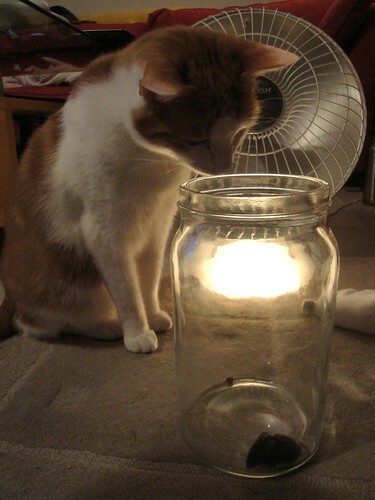 So when Alex caught the mouse last night in a jar, I didn’t know what to do. After some time on the Internet, the only advice I found was to drown it. I couldn’t do it. I wouldn’t do it. This thing was too small (and, admittedly, too cute) to be disposed of in such a manner. 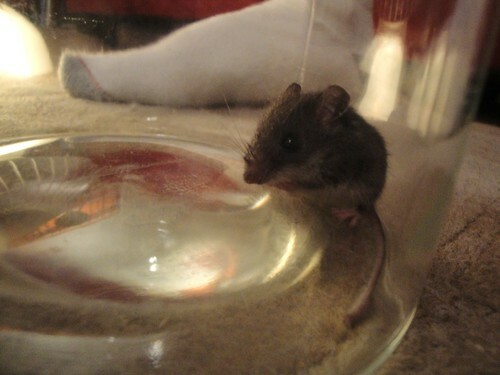 So, instead, I braved the elephants and released this little field mouse into the woods behind my house. This post is for you, little mouse. I hope you survived the 10 or so inches of snow out there… or became dinner for a wet, hungry street cat. Previous PostPrevious How many lifetimes does it take to live in the present day?